I will start by using the immortal words of a famous United States President, John F. Kennedy, when he said “ASK NOT WHAT YOUR COUNTRY CAN DO FOR YOU, BUT WHAT YOU CAN DO FOR YOUR COUNTRY.” Yes, those were famous words and spoken over 40 years ago. But today they still ring true. Now I will change them just a little and ask YOU. What can you do to help your advocacy group? The answer will be quite simple. YOU need to get involved with your life style. YOU need to use whatever means YOU have to get involved whether it be time, or money YOU need to get into, behind, involved with the world that YOU live in. I have spent most of my weekend calling numerous people and introducing myself and asking them to renew their membership within CoMOCAL. The excuses I have heard. People pay several hundred dollars per year for homeowners insurance to protect their homes and belongings but cannot afford to pay $10.00 or $15.00 per year to help fight against evictions, intimidation, abusive park manager/owners, rent increases, and a list of complaints that fills any suggestion box. It is down right criminal some of these abuses. We receive complaints all the time. Telling us they looked CoMOCAL up on the web. We ask have you joined. They say “No, but I will send a check in.” Very good. We take the time and spend the resources to assist you and we take down your e-mail address, then only to find that a letter or number has been left off and/or the telephone number is invalid, or some other flaw. You call, we respond. We ask for assistance, we ask you to support us and only a few step up and are accounted for. The majority of callers are looking for quick fixes to their situations or problems. Even when we give the answer they do not go forward with any actions and we learn that they have been evicted. We learn that the manager is still running rough shod over these folks. It is sad that YOU people sit back and allow another American to treat you as dirt and do not stand up for your rights. I for one am shocked at the complacency of the American public. I can see why we are in such dire straits with our politicians and government, I can see why are gas prices and food prices are sky rocketing because we do not hold anyone accountable. Only a few of us have the grit to take a stand and fight for what we believe in. The rest of you are cowards and lack the ability to say enough is enough. I have been writing these articles for over a year now and I have seen very little IMPROVEMENT. The spirit has gone and that is not good. We, YOU and I, must be prepared at all times to stand and fight. Not so much with punching someone in the face, but to stand and fight with words, written and spoken. Mostly written as that is where WE win with the written word. Me personally I like helping people. I find that very rewarding. However, most people I find will wait until the last minute to start asking questions or start building a defense for whatever situation they are involved in. I realized some time ago that people don’t plan to fail, they failed to plan. That in itself makes it very difficult on those of us that try so very hard to accommodate those that have not planned. There is something wrong with this picture. You know you have a problem, situation or some type of problem that you have lost sleep over, fretted about, argued with your significant other and just stumbled along. Then you decide to contact an advocacy group like GSMOL, CMRAA and CoMO-CAL. Yes, these folks have resources, yes the groups have volunteers that are skilled in various subjects and have either retired from a career that placed them in positions of authority. These men and women like what they do or they would not be involved today as a volunteer. I am sure they will agree with me that they are not magicians and can solve the world’s problems with a nod of their head. I know that they wonder where these folks went to school. Where did they get that idea? Not to say that some of the ideas are great and need to be put into use. But waiting until the last hour to file eviction forms or writing down an incident that happened three weeks ago, or trying to recall a telephone call from a man who is upset over the color of his trash cans is at best difficult from the onset. But this is the task at hand. This is the challenge to reach out to you folks who fail to plan. I know if we were all alike we would have a messed up world, but let’s have some common sense in these matters. I mean an eviction process is a serious situation that needs immediate attention from the first ring of the telephone or the first letter from park management. There are laws, rules, procedures, and agencies that are highly skilled in stopping evictions. There are agencies that can be contacted via telephone call or e-mail that will respond. But I can assure you they do not want to respond on the final hour. So, I ask you to get involved if you have problems don’t wait until the last minute. Bring to our attention. We want to help, we can help but you need to support us in order for us to support you. Let me give you a prime example of what GSMOL does with the Legislative Action team (Mr. Jim Burr). His team and his efforts take a great deal of time and thought to process all those AB (Assembly Bills and SB (Senate Bills) those efforts just didn’t happen they were thought through and over and over before it went to print. That takes time, dedication and the willingness to help all of us that live in mobile or manufactured homes. Another group is your home owner association leaders and committee members. Again a group of talented, dedicated and resourceful people. They ask nothing other than your support and a willingness to get involved with your life styles and your homes. It takes a great deal of effort. These folks are not looking for 15 minutes of fame, they have been there done that and they know the value of doing a job that helps each of us maintain and contain our lifestyles. 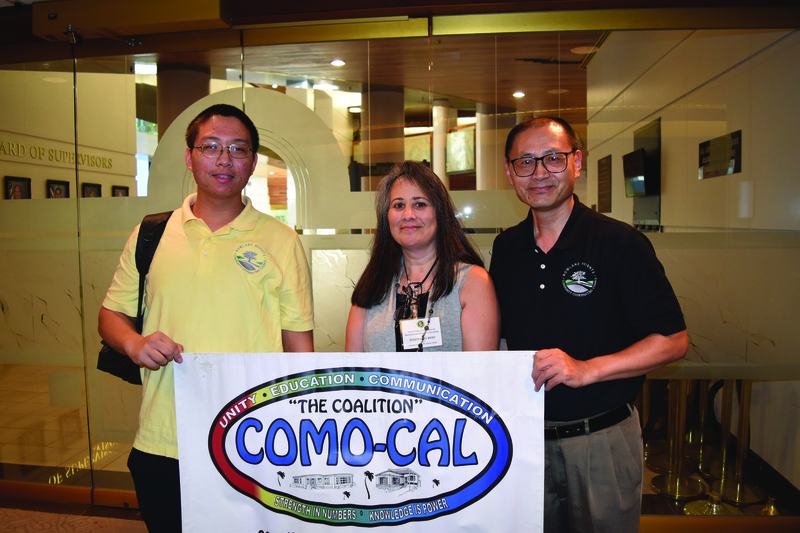 CoMO-CAL puts out a monthly newsletter that is second to none and contains valuable information and a list of resources that can assist each of us. Again they ask for your support in providing e-mail addresses so that information can get to you in a timely manner. Support is critically important. All of these organizations need our help, they need our wisdom, they need to know that you care and are willing to share your comments, knowledge and resources. So in closing lets all try to plan ahead. It will make life much more enjoyable for all of us. Send in your membership applications. Send in your e-mail addresses, send in your comments. Let your leaders and volunteers know what you think. I am can be reached at 530-743-2965 or at anvil95993@yahoo.com.